If you have a question about this site, the product, or a financial transaction, please contact the author at the e-mail address on aol raeganandrjinspace@aol.com and I will get back to you as soon as possible. © Richard Collins 2010, 2011, 2013, 2014, 2015, 2016, 2017, 2018 - “Raegan and RJ in Space” is copyrighted and may NOT be used without WRITTEN permission of the author. Here are two pictures of the author at the U.S. 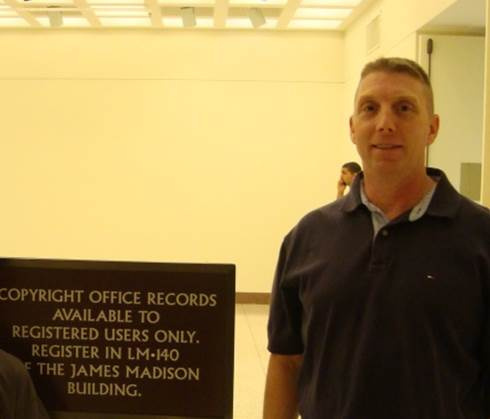 Copyright Office in the James Madison Building in Washington D.C. when he copyrighted the 'Raegan and RJ in Space' graphic novels and story. The first picture is the author outside the copyright office by the sign. The second photo is the author sitting at one of the desks inside the official U.S. 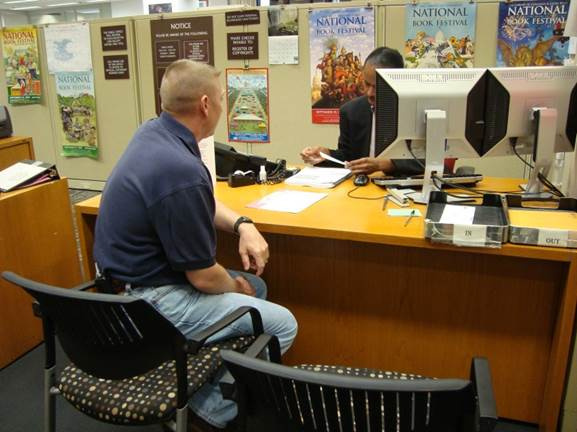 Copyright Office, while the copyright official carefully reviews the R&RJiS paperwork and novels, before issuing the copyright. It was a good day! One of the benefits of living in VA is a trip to DC to submit your works to the copywrite office in person takes only a couple hours, and is fun, interesting, and educational. This web site is run by Rich Collins, who has a valid business license in Virginia since 2010 it is #293309 (2010, 2011, 2012, 2013, 2014, 2015, 2016, 2017, 2018) ; please send us an e-mail if there are any issues and we will endeavor our best to make it right.